After having breakfast in our room, we headed out to Central Festival Mall to do some shopping. Not knowing that the hotel actually provided free shuttle service to Central Festival Mall (more information later), we decided to take a Tuk Tuk. We were so lucky that the first driver we met was a honest guy who charged us only 100 baht, which was below what most Tuk Tuk drivers would have charged us because we were tourists. We met such a dishonest driver the next day and the experience left a bad taste in our mouth (more about that later). The shopping here was so-so for us but the kids really enjoyed the free playground at the kid's floor of the Central Departmental Store. The kids spent more than an hour here while we took turns to shop! 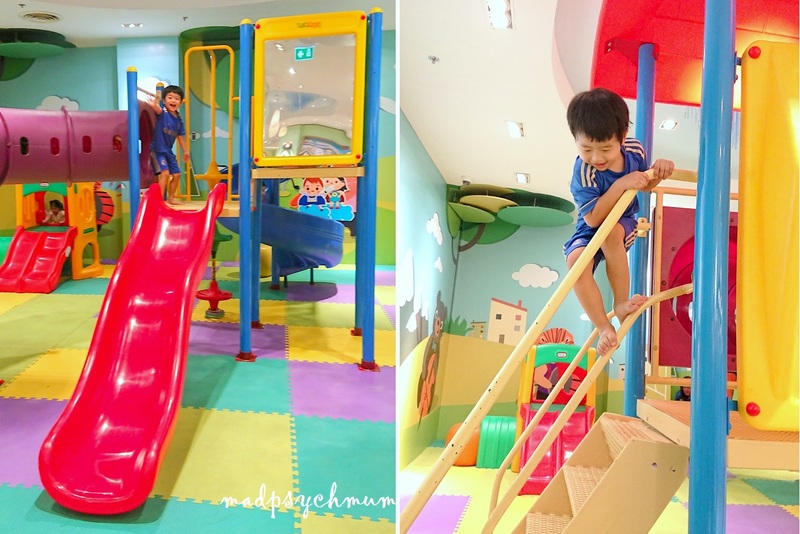 When our stomachs started calling out to us, we had to drag the kids out of the playground for lunch. Most of the restaurants had crazy long queues so the hubby suggested the Food Park, a food court located next to the arcade Fun Planet. Unfortunately the food wasn't really great here and the service was so-so. I would suggest eating elsewhere if you visit. The girl really wanted to ice skate but we weren't keen. The Mum-in-law decided to let them ride the Fun Planet train instead (can't remember exactly how much but should be around S$3 per person). There's also an IMAX theatre and other entertainment like karaoke too. For us, we continued shopping while the kids played in the playground until we were all ready to leave. 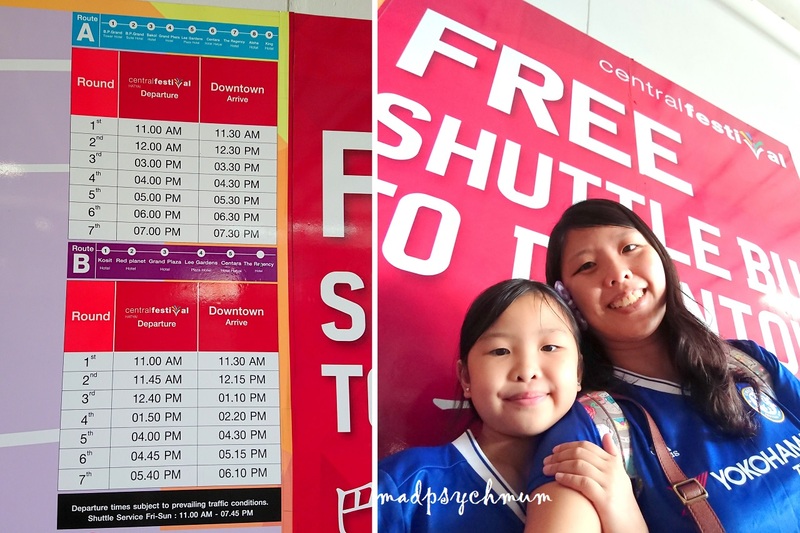 There was a FREE Shuttle Service back to Lee Garden Plaza! You can board the Tuk Tuk at the entrance to the car park next to the supermarket at the basement. Depending on the crowd, you may not be able to get on because of the small capacity. Hence, do try to avoid peak hours when travelling back. As mentioned, there's also a FREE shuttle service from Centara Hotel to Central Festival. You can check the schedule shown above, which is found next to the hotel's lift lobby for more information. We arrived back in Centara Hotel to the sound of firecrackers, beating drums and clashing symbols! 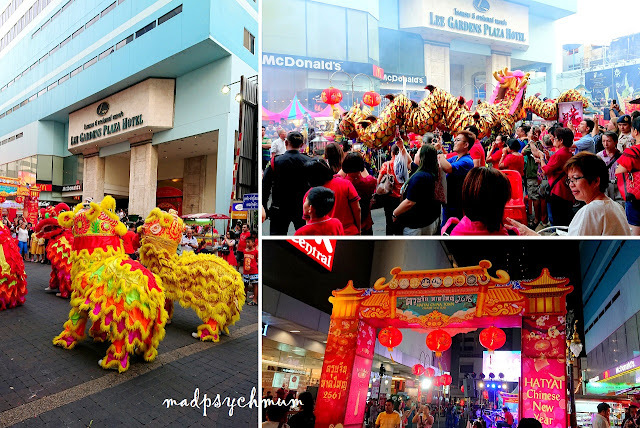 The celebration was on at Hat Yai Chinatown with dragon dance and lion dance! We could hear actual firecrackers exploding almost every 15 minutes since yesterday but we managed to see it in action today. It was quite a sight for the kids! 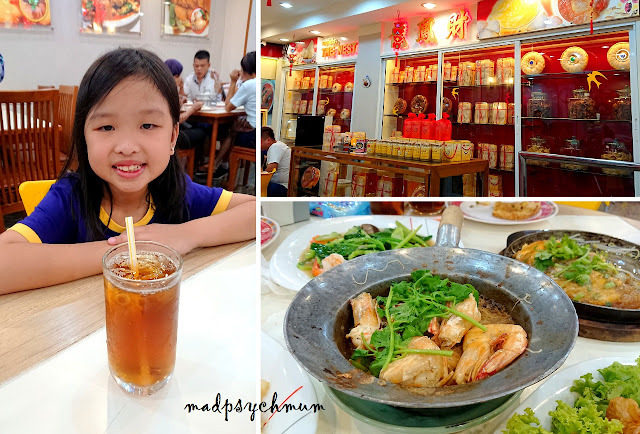 We decided to have dinner at Lee Garden Plaza Hotel's restaurant, Tian Chwu Chinese Restaurant, for traditional CNY feast. Very cheap fish that only cost us S$19! 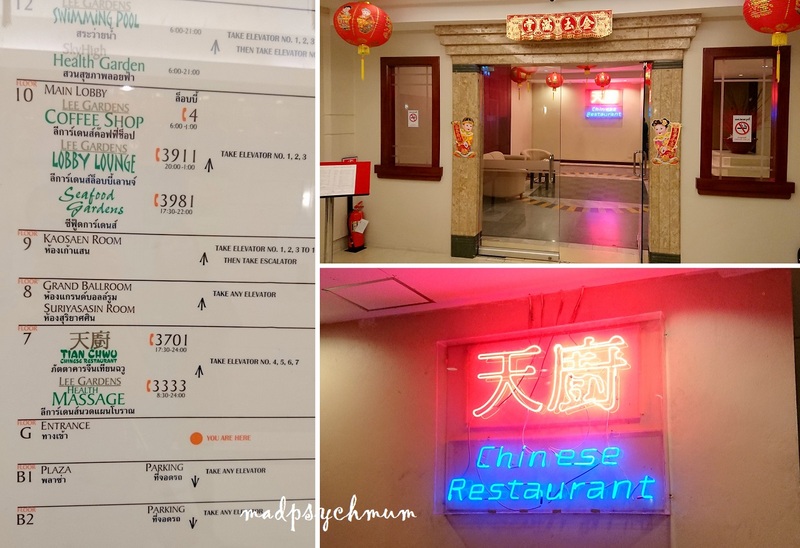 The food was OK and the price was cheap but the constant live karaoke singing by guests was just too noisy for us! If you can't stand constant singing in the background by amateurs, you might wanna skip this. 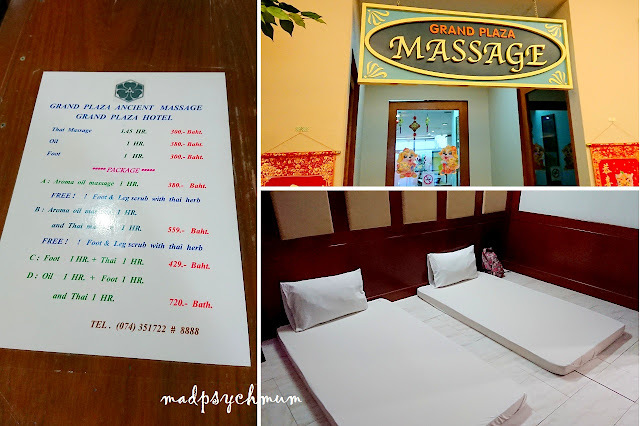 After dinner, a few of us went to get massages at Grand Plaza Massage, located at Grand Plaza Hotel. I chose it based on a gut feeling that it might be cheap and good. And I was right! My 1 hour aroma oil massage only cost 380 baht! I got a room by myself as the bro- and sister-in-law would get their massages together. Don't expect luxury for the price but it is very value for money. This morning we decided to have breakfast at Top Supermarket located at the basement of our hotel building. We noticed, whenever we were shopping at the supermarket, that they had a good selection of bread and coffee as well as an area to sit and enjoy your meal. Don't underestimate this little no-name bakery in a supermarket! They had incredible hotdog bread and croissants that reminded me of Paris! The coffee was really good too! There's also packed food you can buy and microwave for those of you who don't like bread and must have Chinese food to start your day. We liked dining here so much that we had breakfast here every morning after that! 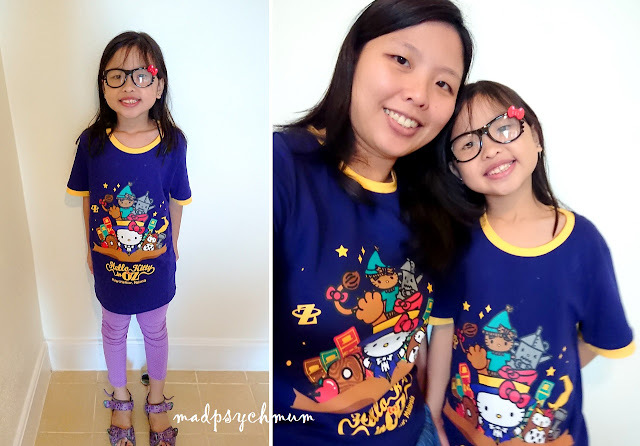 The girl and I in matchy Hello Kitty t-shirts we got from Hello Kitty Town. People thought we were Malaysians as a result haha! We had booked a private car to drive us around Songkla tomorrow and the tour included Klong Hae Floating Market. However, we decided to visit the floating market earlier as we didn't have much to do today and wanted to check one thing off our list in case the day tour was not enough to cover all the places we wanted to visit. We ended up regreting it because of our terrible experience with our Tuk Tuk driver (more on that in a bit). We decided to get a Tuk Tuk for the 5 of us (bro- and sister-in-law did not join us) and managed to negotiate a 2-way ride for 400 baht. We thought we were all set to go until a Malaysian lady stopped our driver and tried to negotiate a hitch (like GrabHitch but unofficial). He asked us if we could let her and her companion hitch a ride as they were going the same way. I said OK on condition that we pay only half of our agreed amount. He said yes, without actually understanding what I meant (as I will soon find out later). We arrived at Klong Hae Floating Market after 20 minutes. The driver then introduced us to his father, who told us to meet back at 7.30pm and look for his Tuk Tuk. There were a lot of shops near Klong Hae Floating Market! Be prepared to bargain though because the prices are usually marked up. Lots of people at the floating market! We didn't buy any food as we're not too sure about the food hygiene standard plus some of us have sensitive stomachs. We did more shopping than eating and bought lots of bags and clothes costing S$10 on average! Very cheap! We were done in like 1 hour and still had another hour before the meeting time. We instantly regretted allowing the hitch as we thought we had to wait for the Malaysian couple to finish. However, it turned out that they were also done so we all walked back to the car park, hoping to get a ride back earlier. Sadly, our Tuk Tuk wasn't there! Maybe we didn't communicate it clearly but all other Tuk Tuks were waiting patiently for their passengers except for ours. We had to wait at the carpark with 2 cranky kids until our Tuk Tuk arrived 40 minutes later. When we finally arrived at our hotel, I passed our share of the Tuk Tuk (250 baht) to the Malaysian lady to pay the driver. He insisted that we each pay what we originally agreed (i.e 400 baht for us) but I was adamant that I was not going to pay the full amount since another group of people hitched our ride. I argued loudly (and you know I'm very loud haha) that I would not have allowed the hitch if I had to pay the full rate and that I had told the previous driver that. He got mad at us but I stood my ground, glared back at him and shook my head (I was already hopping mad that he didn't wait for us at the car park like all the other Tuk Tuks). In the end, he wanted an additional 50 baht to settle it and that was paid for by the Malaysian lady. I thought it was only fair since they were the ones who insisted on the hitch and caused us to be in this situation in the first place! It was a super unpleasant situation but I was glad I stood my ground and everything was resolved. I was so ready to have a nice, peaceful dinner! We walked passed and decided to have dinner at The Nest restaurant. We really liked our meal, so much so that we went back to this restaurant for dinner every evening after this till we left!